My friend thought that I probably wouldn’t like it, and I understand why — aesthetically, it breaks every rule. But that wasn’t my response. I wrote back, “His book looks interesting. The cover’s messy, but I found myself reading the whole thing. It has a certain hurry-gritty-production kind of energy to it, which suits its topic. 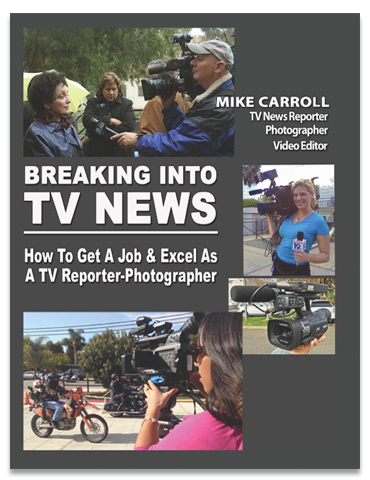 It couldn’t be more direct — “How to get a job and excel as a TV reporter-photographer.” If that’s the job I want, I’m all over this book. Which is to say, it could go to press as is. But it’s a face only the writer could love. So the question is, can it be simplified and made more attractive using the same photos and words, while retaining its harried, behind-the-camera urgency? Here’s a try. Below is a 30-minute makeover. One typeface (Gotham Ultra), narrowed design area, edges flush, material centered in a linear sequence — head, subhead, photo, byline, etc., right down the page, black, white, red — forceful colors. I sent the makeover to Mike, who was appreciative but underwhelmed. He replied, “I feel it looks too much like a how-to book or textbook. The red lettering is a bit overpowering, and I think that the lettering being in bold blocks is too strong. I feel the subtitle needs caps as opposed to lowercase. Caps give power and authority. The book is geared for students, but I don’t want them to regard it as a textbook or a schoolbook. I want them to want to read it, so they can find out how to fulfill their dreams of working in TV and making money at it. It’s attention-getting in a tabloidy kind of way, but I like this one less than his original. It’s been prettified without becoming pretty. The blue and gold soften a message that was better with an edge; the appeal of the original was its workaday, get-er-done earthiness — news is breaking, grab your gear! Now, it’s a page of colored blocks. Designing with blocks is a way to get big blasts of color onto a page easily, but it’s almost always a mistake, the problem being that the blocks, not the words or pix, become the primary visual elements but have nothing inherent to say and so siphon off attention. Also, blocks demand structure but here have very little. 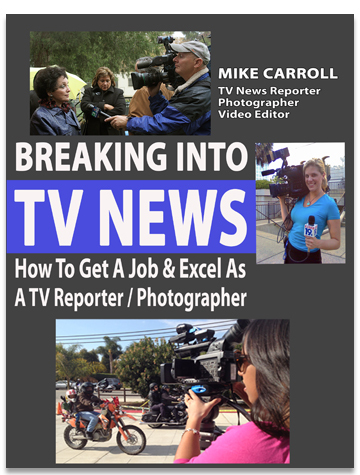 I’d also say that by reducing the size of his subtitle — “How to get a job and excel . . .” — he’s weakened the key element, the part to which I, the reader, can relate, and the reason I’d buy the book: I want a job in TV news. His original cover appealed directly to this desire in a way that allowed me to visualize myself on the scene working.
. . . and after mulling it for a day, he wrote back . . .
“I think I’ve infected you! I thought my first cover was busy! But I do think it is nice. “Reading over your comments struck home. You’re a professional designer. That made me think again. In the designing and redesigning, I lost sight of having the How To Get A Job & Excel As a TV News Reporter/Photographer on two lines as opposed to one. Only after seeing it in your note did I realize it was too small, so it’s been corrected. Also, my wife agreed about losing the orange swash across the front. And she felt the cover was too dark, so I’ve changed it to gray; I don’t want the black to be oppressive. And in the end he went this this, which is available in paperback and Kindle on Amazon . . . I enjoyed Mike’s gutsiness and commitment to his book. I closed with, “I’d tell my readers that these are all the same design. That’s why a coin flip would work. My original ‘textbooky’ one is only slightly different, not enough to qualify as a different concept. “Whatever your design, key is to be intentional. No arbitrary font choices, colors, funny shapes, backgrounds and other hoohoo. You should be able to justify every decision — why this typeface? why that rectangle? why that color? As with writing, every element must pull its weight, and if it doesn’t, deep-six it. What’s your take on this? Would a professional design be worth its cost? It could be more expensive than an independent author could afford, and how could he know it’d be right? We’ve seen before that a client-designed piece can capture the soul of its subject better than a designer’s that follows the rules of page layout. Mike’s now working on his second book and will bring to it the design lessons learned on this one. My advice to Mike, given his independent modus operandi, would be to find a designer with whom he could sit at the computer and together work out the design. From the beginning. Together. Back and forth. Lots of conversation. This entry was posted in Critique, Design. Bookmark the permalink. 104 Responses to Does the client know best? I’m grateful that you support the no-frills look of the original design. There is something to be said for something that seems to come from the heart of a practitioner rather than the hand of a designer. It reminds me of how corporate videos can be made boring by slick filming and editing. The first one (the original) was the best! The first one was the best — double that. I like the black much better than the grey. Also, except for the text at the lower left that gets somewhat lost, I like the original design the best of all. It may not look professionally designed, but I don’t think the others look that much better. It has the right feel, and if a professional designer had been the one to come up with the original design, it would have been a good fit for the project. I’m with you all — the first was the best. The resulting cover tried to take the comments to heart, but in the end was a weaker design than the original. I don’t know why, but I prefer his design. Except for the lower part (his name). I prefer your layout and colour (red). Hope this is not an offend to you. Although the first one was ugly I think it was the best. Somehow it just makes me want to read it and find out more! I would not call it ugly at all, but I agree, it was the best. I liked the original layout from the beginning to the end of the post, maybe because it is so strong, maybe because it looks so much like what an editing room would look like, maybe because it breaks the rules — but it works! Bear in mind, not everyone is a designer with an experienced and trained eye. I know many people who would gravitate to this book because it looks cool, strong, and to the point -– and not like a textbook at all, like some of the other versions (sorry!). I almost don’t mind the fonts Mike chose. I do have an issue with the alignment of some pictures — I am a designer, after all — but if I wasn’t a designer and was looking for this kind of job, I’m pretty sure I’d buy this book. I think you’re right; “ugly” was a bit strong. I guess what I mean is that it breaks all of the “normal” rules, but it still works anyway, and, in the end, I guess that is what makes a good design — whether or not it fulfills the requirement. Which, in this case, is to encourage people to want to read it. It worked on me! Normally I find that your designs, John, are far better than what you have been asked to improve, but in this case I found that I was drawn to Mike’s graphics every single time. This was a case where making the cover “pretty” seemed to go against the book’s credibility. 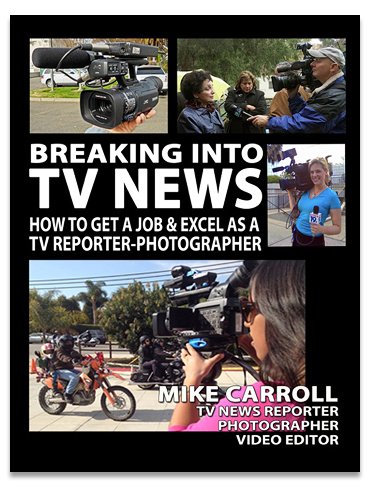 I found Mike’s instincts to be right on, and if I was interested in getting into a career in TV news, I would definitely buy his book. I absolutely loved this discussion, which exemplifies the key issue of good design . . . understanding your audience and working collaboratively with a client. I also agree that, in this case, the client didn’t need a designer! I think the fourth one down on this page (white text in blue box with red subtitle) is the best. The title jumps out at you. If one looks at his homemade design as a singularity, then perhaps it is intriguing, but on a shelf with other books or on a page with other e-books it could easily be missed because the title does not stand out. The original cover resembles a TV screen during a news broadcast. Lots of things going on (thank goodness, no scrolling required! ), but it fits the topic. I’d stick with the original. I really liked the article until I read, “find a designer he can sit with.” Nightmare. Any designer who would let a client sit beside him from the beginning is either a saint or a bad designer. I do think there’s something to a client’s instinct for their brand that, as “hired guns,” we never fully understand. We try. We use words like “reposition” and “creative brief,” but unless we’re mounting an aggressive rebranding, we’ll never get it as well as the client does. In the case of a book cover, the appeal of the original is that it’s a mess. It feels homemade and sloppy, but it addresses his brand message (“this is fun, and I can do it — even without a fancy camera or any real training”) perfectly. Some of the most fun I’ve had in design has come from exactly this kind of collaboration: sitting at the computer side by side with the client and together working out the design. I once won an international competition this way. It goes without saying that, for this to work, the client must be totally committed to the project, which, in this case, Mike is. It also requires absolute, peer-to-peer respect and even mutual admiration. The clients I work with are small business people just getting their dreams off the ground. Talking through the design work helps them clarify, crystallize. It can be a frustrating process, but I know that, too, is a service they value, and it builds relationship. They really feel listened to and helped. The final version pains me with its partial right-hand blocking. When he went grey, the original intensity disappeared. Black was the appropriate color for the background. I agree with Nikola that the original was the best. Your first re-do with the black background looks like a book I would want to read, too. Another great “lesson” in design. The books I design are for “print on demand” services and as such involve lower-quality printing. The final cover design has photos which neither bleed off the page nor stay away from the edges, so multiple copies of the book (as in a stack in a bookstore) will show variations in the setback of those photos from the edge, which make the book look cheaply made (subliminally). So, I found myself either wanting to pull back the photos from the edge, or I favored those with bleeds. I didn’t notice this at first, so this was another lesson in keeping an open mind and not letting one’s typical restrictions inhibit one’s thinking. Thanks again for sharing this with us! As they say on the evening news, I’m confounded. If it’s “I want them to want to read it, so they can find out how to fulfill their dreams of working in TV,” then that’s the purpose statement (and a bit of a holy grail), and it becomes key to design with an eye focused towards their interests, their fashion, their sentiment, etc. I’d start with less Mike — and more youth, vibrance, action, and energy. After years of your email, I have finally become a true subscriber. Thanks! I appreciate your patience in this story. At the end of the day, the aesthetic of the client’s design leaves me feeling less confident in the quality of the book’s content. He should have trusted your instinct and talent as a designer. The best design speaks to the audience it’s intended for, and your design does so appropriately without looking unprofessional. Seems to me that it would have been in the client’s best interest to trust the designer on this one — the fourth one down conveys that degree of professionalism, in my opinion. What a lesson in respect and integrity for everyone involved. It’s so easy to feel insulted when you perceive your design expertise being simply tossed away when working with a client. Nice illustration of how to keep the conversation going. Your second design was the best. It kept all that was good about Mike’s original cover, but added structure and polish. The photos that bleed diminish the dark background and add expansiveness. The final that went to press was a weaker version of his original idea. 1) Grey does not always print well, so paperback guys will be a bit disappointed. Black is better. For Kindle you can do with anything; it is not a problem. WYSIWYG applies to Kindle. 2) I prefer your first makeover as my second preference. Last I would go with the original. 3) Then we can use images in bright black & white and text in one colour. As an experiment. I absolutely prefer the last one John designed (the one with the pix acting as a background with virtually no black background). I feel like it gets the point across and appears like there is less to read — even though there is the same amount of text. Also, the use of both bold and light fonts gives it more interest and depth. I just don’t want to be bothered reading the other ones, because it feels like too much reading and too heavy. Personally, I never would have picked up the book to see what it was about (on any of the other designs, besides John’s last design). However, if I had to pick one of Mike’s designs, I definitely would have gone with his original — it has this gritty rawness with an intangible attractiveness to it. SO many good comments here! I agree with your thoughts re: client vs. professionally designed pieces. Too many times, I’ve seen a lot of money wasted on professionals who produce something slick and pretty with absolutely no relation to the ideas to be communicated. On the flip side, I liked your takes on the design better, but I think I am drawn to pieces that are symmetrical. Not sure I agree with you re: use of black backgrounds, particularly when used to promote visual arts. I think it helps draw the reader to the images — the gray just looks weak to me. A fine article! While I like the unadorned, truthful and gritty look of the original as well, I think John’s version with the blue header bar works better to convey the information. The blue header breaks in from the edge, breaking-news-style, commanding immediate attention. I like the picture of Mike above his name. The final version is more ambiguous as it sits between two different pictures, above a picture of a woman who looks like she could be the author. Also, initial-capitalizing every word in the subtitle is distracting, clumsy, and hard to read. John, I really prefer your version. It is a design that puts the focus on the right elements, and removes the awkward parts, without making it appear like a designer was in charge. For me, I wouldn’t buy the book with any of the writer’s covers, or at least not for as much money as I would have paid for the book in a professional cover. To me, design = perceived quality. Why cheapen a book unnecessarily? I like the first (“30-minute”) makeover the best. Great conversation. Our challenge is to know the rules and when to break them for the sake of the soul of the piece. And, I have learned another lesson — to not just put pretty design in place of the original just because you know how. I once spent hours redesigning a logo for a rheumatology practice, only to have to revert to enhancing their original (albeit funky) design. I’ve been getting Before & After since 2003 and consider your wise design concepts as those of a sage, but I just can’t agree with this design. I think the black blended into the back so that all I saw were the images and text, but the grey muddies that. The red text was definitely forceful, but it was tooooo much. The one with the ocher looked like a magazine and thus encouraged users to open it, read a few pages, and put it down on the coffee table, which is not his intent. I think the one with Carroll’s pic on it and the blue was the best iteration, although, when I saw the first layout, I was tempted to go out and get it for my youngest, who has that interest. The latest layout leaves me wanting for more and not inclined to move to purchasing. What I did glean from this is just how powerful the initial-impact-to-pocket connection is, and I don’t think I had thought about that power before. Thanks for the lesson. The first is better than the last, in my opinion (don’t like the gray). But for me, the fifth (the one with the bright blue box) would have been the best choice for its intended audience. What David said. The original design ain’t bad at all, in context. I could have had some fun with that back cover making it look like a down shot of a marked TV script. But then, I really relish a good back cover. I know when I’m buying a how-to book, I want to get some kind of sense that the author knows what he’s talking about and is at a certain professional level. I don’t get that with any of his cover designs — quite the opposite. I think it can be gritty and look professional at the same time without being messy. I think the final gray washes out the photos, and the text ends up too bright. The photos themselves are a bit washed out by the gray field, and the sharpness of the images seems off due to it. Of course, that is comparing two different JPG images, and the printed book may look different from the JPGs above. I too like the first iteration. While the white text still pops the eye, the quibbles above seem mitigated by the black field. I love your work and your designs, but after reviewing all of these (and having been in journalism for 23 years, much of it as a photographer and writer and two years doing video), I have to say that I like the original design better than any of them. It conveys the tension, excitement and feel of video news, and it just, well, just feels like a journalism STORY rather than simple how-to book. It’s not inspired design, but it conveys something urgent and “NOW,” much like television news often does. It had that energy and journalistic feel to it. I felt like, “this guy is a journalist,” when I looked at it. Great debate, and I love that you guys played with it so much. But of all of them, I’d head for the original first. I don’t get it. If he wants to get the message across that he is successful and professional as a news reporter and photographer, why does he want an amateurish cover design? And he should realize that just as it takes training and talent to be a good reporter and photographer, it takes training and talent to be a good designer. My favorite design is the first 30-minute redesign of his original cover. The red really pops and the alignment of elements creates a more balanced design. The gray background is horrible. I was most drawn to the dynamic between client and designer in this exchange. My background is in architecture, and now I help architects with new-client development. Many of my clients, like Mike, are DIY types. That works when their personalities and approach match the prospect. It’s a disaster when they are trying to reach a different audience. A good designer, like a good lawyer, can add objectivity and perspective, which are frequently needed by “creative types” like architects and TV camera guys. A great designer has talent, empathy, and the patience of Job, like you, John. I think it’s great when clients do a draft design. It can really help you understand and discuss what they are trying to communicate, and it helps you discuss your subsequent designs and why they perform those tasks better. John’s designs are the only ones here that look like “real” books, and the author would be well advised to pick one of those instead of his mishmash collage of non-aligned objects and uber-crude typography. And, yes, I do take my own advice. My design skills are perhaps B grade, so when I self-published a young-adult book written by my later brother (Swords for Hire — check it out if you’ve got kids 9–15), I did the internal design but knew enough to ask a friend with A+ design skills to do the cover. Your initial 30-minute makeover is by far the best. I agree with Trisha, who said that design = quality. Well, that was fun! But I liked the fifth one best. And yes, I agree with the previous comments about the final, gray color. Doesn’t work for me. And I do have a question about whether you advised him that lots of copy in small, reverse type on the back cover would be difficult for most people to read and frankly a turnoff. Put a light color block behind it and go with black type. Also, cut it by half in length. I think the first makeover you sent him was the best of all these choices. I like the cleaner look of it and the bold text with fewer, yet more pointed photos, and the black background. His original design wasn’t too bad, but your first suggestion made perfect sense to me. It’s interesting how clients want to have the last say, even when they are working with a professional designer. But it’s his book, so if he’s happy with it his way, he has that prerogative. I wish him success in his sales. Everyone knows you can’t judge a book by its cover. I’m with John Driscoll and Bfhorne in my thinking. Yes, I do appreciate the amateurish “energy” of the client’s own designed covers. There’s certainly value there, and it’s useful for this kind of book. But selling a book is hard. Really hard. People have been burned far too often by far too many books that don’t deliver what they promise for a variety of reasons. The result of all this is that people have a very high resistance to buying a book. They’ll read the cover, the back cover, the inside flap (hardcovers), the front couple of pages and still will be hemming and hawing over the purchase decision. The smallest thing still left behind as a purchase barrier means the sale won’t be made. Often that final barrier is the all-too-subtle essence that the book was self-published and therefore lacks credibility. A well-designed cover adds credibility. It speaks to the fact that someone who knew what they were doing was involved in the process. There are many well-written, self-published books, but most of them never see the light of day for a single reason: the cover designs make them look like self-published books, signaling danger to book purchasers. When the cover has that extra bit of polish in its layout, it immediately overcomes that important purchase barrier and leads to more closed sales. Ultimately that’s what it’s all about. It’s unfortunate that the author asked for John’s advice and even recognized his experience as a professional designer, yet was reluctant to truly embrace the advice given. In the short time he spent on them, John didn’t nail everything (I thought the red was all wrong, for example) but his ideas pointed in a much better direction for adding that vital intangible element: credibility. George, your observations are astute. Potential buyers don’t want to make a mistake. That’s the power of a good cover — to relieve their doubts and close the sale. Both of you ignore the rest of the cover. There are three panels, not just one. In a bookstore or on a library shelf the spine is important. And in either locale, after absorbing the front cover (5-10 seconds), the browser will flip it over to read the blurbs back there. That is where the sale will be made. Even when buying online, the potential customer wants to see the stuff on the back, either a sales pitch or review snippets. You of course are correct. But it was outside the scope of this article. I think your second attempt appeals to both a designer and a person who would be interested in the subject. The design needs black as a background given the nature of the subject, and your second design uses that well. It also, pictorially, identifies the author, highlights women in the business and the people-centric nature of the career choice. Not sure about the blue in the main title background; it needs a stronger color, but I’m not sure at this moment what that might be. Wish his final version had not used gray. Gray backgrounds, in this context, shout to me, “I’m trying to be safe.” Rather than the gray, I think he should have gone to print with the original cover design. I’m shocked at how many people prefer the original design. Hmmmm . . . I prefer layout #5 and then #3. Both require just a tad of meticulous adjustments, however what I like about them is their sense balance, alignment, contrast, hierarchy, and better-set type. These qualities give off that professional feel that a book should have — regardless of who the audience is. I do my best designs when the client gives me a general idea of the feel they want, maybe some examples of what they like, and then let me go at it. The clients seem happier that way, too. When they send draft designs, it just takes away some options I might have considered and that they may not have thought of. However, working with your client within how they like to work is what it’s ultimately all about. And coming up with something that they’re happy with. The client’s original and the first revision were my favorites. My least favorites are the third and also the final design. If I saw any of these on their own without the others, I’m sure they’d all be fine for their purpose. I liked the original cover the best. I’d be really interested in reading the book if I was interested in a career like that. I liked your second makeover the second best. The rest I’d have to say I really didn’t care much for at all. I can certainly appreciate the energy in Mike’s original design. Problem is, it’s undercut somewhat by the execution, particularly the readability of the author’s name. My wife is a copy editor, and a key part of her job is improving the clarity of the writing while keeping the author’s voice. That seems to be the brass ring here. I’m not sure any of John’s designs hit that goal, but they’re on the right track — improving the readability and impact, especially at a reduced size. The trick is how to do that while not watering the whole thing down. With regard to collaboration, I completely agree that some of my best experiences were sitting with an editor when both of us checked our egos at the door and were focused on the final product. John’s two designs are miles ahead of the others at conveying a message and attractiveness for a book cover. More than the result of the actual design, what I got most out of this synopsis was how you and the client had a meaningful discussion about emotion and content. The discussion wasn’t around “how do I make my book pop off the shelf” but rather “how does my book establish an emotional response (i.e., I don’t want people to think it’s a textbook). Wow. How refreshing. I think your initial response set the tone for a meaningful conversation that was focused on establishing an emotional context and not a beveled shiny drop shadow. I appreciate that there are some clients who have a perspective that could be very important to the overall effectiveness of a design. John, you gave a perfect example of such. Of course, this isn’t always the case, as I’m sure we’ve all experienced. In this case, the author has the best perspective of what the target audience will be looking for. Personally, I like his first attempt. As you pointed out, John, it gives the feel of action, such as what you might find while working on site. And the not-so-tight layout may be more eye-catching to a young, inexperienced audience, similar to that of teen or sports magazines, for example. I like your descriptive word of “sanitize” the design. Isn’t that a basic learning process in the growth of a designer — clean it up, make it neat, organize it. The rules and methods of design are meant for discussion and evaluation of our designs. They are important guides but foremost should be used in context of the product and target audience. 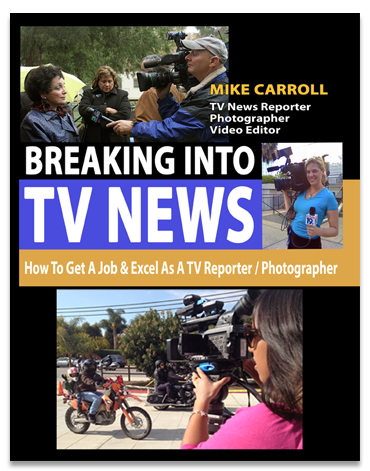 Although the boxed header for TV News has immediate recognition as we see it on TV or the newsstand, it takes away from the personal context of the book. It’s not about the news, it’s about the person seeking an exciting career. John, I honor your respect, humility and patience in how you relate to your clients. Your story really helps to validate my own approach. That being said, your initial 30-minute comp was the only real book of the bunch. It added a level of credibility while still maintaining the author’s intent. I am very, very, very astounded by your patience. This client doesn’t want a designer but a sparring partner. I am convinced that he handles the job with you as a “service provider” in the same way as with other service providers such as lawyers, doctors etc. — in the end always knowing it a liiiiiiittle bit better. To make a long story short: I would have thrown him out. I will disagree with you here. Mike was great. The best creative work requires vision and passion from committed, forceful parties — preferably ones with skin in the game — and out of the back-and-forth can come great results. Both must understand they’re on virgin ground (meaning each project is unique), be unafraid to try new things, make dorky mistakes, voice strong opinions. Each must be willing to give ground as well as stand ground. This can be done with confidence because the parties respect and trust each other and are committed to finding a solution. A weak scenario is to have a semi-passive party who submits to the will of the other — or worse, an aggressive-passive party whose main contribution is to say no. If such a job is paid by time, our clients would get as many versions as they want. But with budget cuts everywhere and flat-rate agreements on jobs, how can a designer provide many iterations and still earn money? The difficulty with clients like Mike is that they want to tinker around themselves and need suggestions and ideas rather than a complete task done. That’s why it is very difficult to estimate how many suggestions they want to see. Under such circumstances a job like that can become a major loss, and that’s why we can’t take such clients. It has nothing to do with being more creative, as the client or the “not-invented-here” syndrome. It is purely an economic decision. I do agree that sometimes it is fun to have a client sitting next to a designer, especially when there is the necessity to try out something in uncharted territory. But it must be a very good designer capable of handling layout, thinking, and talking to a client all at once. We have only a very few people at our agency able to handle such a task. Totally agree with John, such a working scenario is a wonderful one to be in! I, for one, would have picked the second example (your first remake), with all-white type. Its alignment had that bit of “professionalism” that the original seems to lack for me. Thank you especially for this article. I find my mind goes to mush very quickly and then it’s hard to see the good and bad of different designs. I really liked the rule of questioning each element as a choice, so no “trick” is unfounded in getting the message across. It is also a great way to encourage a client toward a smart direction as well as keeping my mind clear and confident in the realm of design. As always, thank you for these articles. OMG . . . What a ride! Went to supporting an idea to rejecting it, then came back to it only to reject it again. That’s before I finally agreed with it again . . .
Did I learn a LOT here! Patience and respect for the client view are essential elements of a good partnership. Hard to attain with a large ego. Sometimes larger than my actual knowledge . . .
Good lesson overall, thank you! P.S. : The 30-min iteration was my favourite, but I’ll keep that to myself. . . Excellent discussion on the design makeover — this really made my lunch time worth it! Think about simply presenting the covers — the original and the 30-minute makeover — to the TV journalism students for them to look at without being prompted. This is a technique that has been in classroom use — simply put them up on wall or on easel and then walk away. I’ve worked with my boss, who uses my design skills to translate his visions at intervals. Discussion is important throughout — I agree on this point. Please continue to do good work on the video presentations, Let’s Talk, PDF design download, etc. Thanks so much for the informative Before & After series! I liked Mike’s original design the best, although I usually love John’s improvements on any project. I really dislike the gray background. I think it would make me pass up the book entirely. It’s so drab. The black added excitement. That said, I wish Mike the best of luck with his book! They are all about the same, really. I don’t see one of them selling more books than the others. The photography isn’t helping any of them. One of the more disturbing lessons here. Just shows it’s a mistake to assume that good design is automatically preferred. Sad as the ending looks at first, it’s actually comforting, in a way, to see ideas from pros like John get discarded. It reminds me not to worry about things I cannot control and just do my best, come what may. The author even trashed his own good beginning. But I think it would be wrong to berate him for it. No regrets. Just float above it and keep learning. No surprise the interior is weak. I have a number of books in my library where the sins of the cover are visited many times over on the pages inside. Common problems? The book is too big, tiring to hold, and not portable. The margins are too narrow. Leading too loose or too tight. Sans-serif type. Lines too long. Mandatory right justification, even if if means that word spacing goes bananas. The result is failure, because only a very determined reader will read a poorly designed book all the way through. That’s a shame, after all the effort put into writing it in the first place. Here’s to savvy book designers who save authors from this fate! Great commentary on an interesting design challenge. Just my two cents, but I thought Mike’s improvements got progressively farther away from both his original intent and good design. The original design had immediacy and verve, but I still preferred the 30-minute makeover version as the most credible in suggesting quality content inside. Note: The version that was settled on has a microphone dangling over the adjacent videographer’s head, with a graphical element shape that suggests a ransom note. Wow. We all know you can get so wrapped up at times that obvious touches like that go unnoticed. Count me sympathetic but firmly unconvinced on the outcome. I like best the first cover Mike did, but not because of the subjective reasons others mentioned. I liked it because it operated in three dimensions. The cover motif or meme that echoed Mike’s real-world experience and expertise was that everything on the page moved back and forth from the viewer to the camera to the subject being filmed. The black background was strongest, because it evoked the concept of space and its 3-D associations. Even though the author’s name was placed over a photo and the text was harder to read, it had shadows, again suggesting this mediated view of the subject. Everything on the page literally places the reader into the same physical position that Mike occupied as a cameraman and photographer on the front lines. I want to buy and read his book because his cover literally gives me a hint at the spaces I’d occupy if I were to follow his advice pursuing this career. If I were redesigning the original cover, I’d keep the background black, maybe remove the top-left photo or make it bigger, or use it to replace the second-row photo. I’d enlarge and bleed the bottom photo off the page, cropping so that just the camera and hands are seen, not necessarily the woman’s face, strengthening the idea that anyone picking up this book can get to be behind the camera, too. See, you are practically holding the camera while holding this book. Of course, I’d refer back to Before & After article 622, Unleash the Action, to really play up the idea of 3-D design. Just my thoughts . . . I thought your second makeover was the best of the lot. And what he ended up with was the least effective. It looks like a manual that was published by photocopier. Not sure why he insisted on that cropped shot of his camera that underlaps the photo on the bottom. It does nothing to further the sense of drama or immediacy of TV news. I grey were to be used, it should be in the furtherance of the 3-D meme to suggest distance from the foreground. Mike doesn’t need a designer, he needs some design training! He seems to have strong opinions, but not much sense of how design can improve his work. In the ideal world, he would surrender his aesthetic to a trusted designer and concentrate on what he does best, but that doesn’t sound like Mike — or some clients I know! This is where a designer can work in a supporting role to minimise crimes against design. “You want to use WHAT font!? — okay, but let’s make it small and elegant.” “You want to use ALL those photos!? — okay, but let’s make them fit together better,” etc., etc. How many people clicked through to Amazon and bought the book? Just me? I’m ok with that. So, how much could we all charge for a book cover design? How about a digital book cover design? How about knowing that most will probably make very little money for the author (I’m not insinuating that is the case this time). I am 40-year commercial print rep specializing in servicing graphic designers — great, talented, world-class graphic designers! I have developed a personal design taste from this continuing experience, and I admit I couldn’t face a blank sheet of paper waiting for a design very well myself. But I have lots of critical opinions of others’ work nevertheless, based on many years of observation. One of the opinions I’ve developed is that designers need the discipline and collaborative involvement of a client or such to do good work. I have seen many “terrible” creations on work designers do for themselves — their business identities and marketing promotions, etc. I’m talking about when they are free to do what they want without someone else influencing their concept. We sometimes ask our best designer customers to do print-promotion designs for us in trade for printing promotions for their business — and two out of three are unusable. It’s not that we are picking the wrong people. These are talented, successful people. It’s not that we are too picky. Just the opposite, we are easy because of the political fallout of labeling their work unusable (how insulting). I find this to be an unexpectedly strange phenomenon, and curious. I admit that it goes against the idea in the book-cover article just read — the idea that people know their need best. If you agree, why do you think this might be? Pete! I love your comment. I have always said that I am my own worst client. When I am doing a piece promoting my own work, I have the hardest time getting started. I find that when I have no restrictions, no client telling me, “I hate green,” or, “it has to appeal to this age group or that gender,” I freeze. Where to begin? I find that I have to enlist the help of my fellow design friends for some honest advice to help reign in my thoughts. Now this sounds crazy — we’re artists, after all, and we are all dying to be free of a demanding client. But with many things, getting what we want, in this case total creative freedom, can leave us like deer in headlights! This all goes back to the original post — there is a delicate balance between making something look pretty/slick/designed because one has the tools and ability to do so, and not losing sight of the author and the audience. Sometimes “homemade” or “self-made” conveys the message best, even if it’s not the prettiest cover on the shelf. I liked Mike’s original design; I think it worked best in black. And I was surprised myself because I always love John’s revisions, and this time I was underwhelmed (sorry, John!) until I came to number three with the title in the blue box. That one caught my attention. Does it work better than what the author went with? I guess we’ll never know. I have often thought books should be published with a couple of different covers and sold side by side to see which one sold best. I know, expensive experiment. Three photos — with people — are better than four, and the photo of the camera by itself is the odd one out. I understand wanting to show an inexpensive camera, but someone should be shooting with it. Perhaps he could stage a shot. Then that photo could replace one of the other three. What I liked in your article is your approach to the design from a wider perspective. For example, understanding Mike’s personality and his hand on everything and how he has a better connection with the subject. Great lesson that we have to look at the design not just as right-and-wrong rules but deeper psychology. My vote is to either stick with the original design or use the first revision (my favorite), which effectively tidied things up and brought out the title. I agree with your first take about the “hurry-gritty-production kind of energy to it, which suits its topic.” And that a designer could easily “sanitize the life right out of it.” Frankly, I believe that’s what was happening with each revision thereafter. This reminds me of what website design has taught me more than anything, and this is after 20+ years as a graphic designer: that design is NOT the main thing. The most effective websites are not always the most beautiful. In fact, the most beautiful are just as often the least effective, in terms of actually producing results (i.e., sales). A website (or book cover, in this case) must, first and foremost, function for the user, similar to a software program. For example (Mac users cover your ears), Microsoft put out a “more beautifully designed” interface with the introduction of Office 2007, but alienated many users with a completely unfamiliar and, therefore, not-so-user-friendly interface. I know that I for one would have preferred improved functionality and ease-of-use over a fancier “ribbon” interface any day of the week. What I want is to be able to get what I want out of a product; then and only then does “beauty” serve as icing on the cake. I know, I know — there’s value to beauty, and what would be the harm if the entire world, consumer products included, were beautiful? Well, the subjectivity of beauty aside, not all consumer products rely on or even require it equally. In this case, we’re not talking about fashion design; we’re talking about a very utilitarian book with a how-to focus. The cover art needs to reflect that, so that the reader can quickly and accurately tell what to expect and make a purchase decision. Again, I think the first and second covers accomplish that, for the realistically small target market this book would have, better than any of the revisions that follow. They may get prettier as they go (well, even that’s subjective), but they don’t get any more functional, and there’s nothing to suggest that they’ll lead to more book sales. Sure, we designers who read this blog may not be attracted to it. But then again, we’re not looking for a career as a TV reporter-photographer. I’ve worked as a broadcast engineer for 35 years. I work closely with the news department doing live broadcasts in a control room. My viewpoint is probably unique and doesn’t necessarily apply to print media, but here are my thoughts. Up until a few years ago, our screen aspect ratio was 4:3. Now, after HD conversion, it is 16:9. So our real estate for TV is always landscape, not portrait. When we present any kind of news broadcast — which, of course, showcases photographers’ work — it is always shot with this 16:9 format. Our photogs would never shoot portrait unless they were in a cramped situation. So the real estate on either side of the screen really matters. Fill it with interesting stuff. Colors for sets and anchor clothing are chosen carefully. Whites, pure reds and dark hues of colors are never used. Men still wear dark suits, but their shirts are never pure white. Women often wear jackets that are closely cut, and colors like yellow are just awful on the screen, while subtle blues, teals and fuchsia look super (think jeweled colors). Black traditionally was accomplished by mixing all colors together. This would require the transmitter to run at high power to accomplish. So there is more to the rule of not sitting in black for long periods of time besides it just not looking good! So to this day, we intuitively avoid black on the screen. During broadcasts we would never block text in this way on the screen. Nor would we struggle with composing multiple images with different frame widths and heights. Backgrounds are never black — well, except for Charlie Rose. Now with HD, we use subtle, lighted backgrounds in soft blues. Monitors are positioned on the set background and have subtle renditions of our logo. Our full wall monitor (background) rotates various videoed, wide-angle, “live” scenes of the city behind standing pairs of anchors. Anchors are rarely shot center screen on head/torso shots, but always to one side with some graphic on the other side, with a subtle styled skirt underneath. When we super text on the screen for identification, it is invariably used as a lower-third, two-tiered styled banner that is designed for a bug on one side and the station numeric logo. We don’t float text anywhere by itself on the screen. If we were to have a styled graphical title for a beauty story, it would be screen left or right, depending on which side the anchor was standing. So looking at the various renditions of covers, I would have gone with a landscape version of the book to represent what we do in TV. I would have chosen a subtle, single, wide-angle shot of some outdoor news story, such as the bike story, with an over-the-shoulder full shot of the photographer, screen right, facing into the center of the cover. Place the book title in the upper left (over the sky and clouds) with subtle, halftone-gradient framing (think full-screen skirt) to subdue the photo. Place the book subtitle on a lower-third (full width), gradient- (semi-transparent) styled banner, with a second tier for the author’s name. We just don’t use red fonts, ever, and there is a funny story behind that . . . black or white, but never fonts on the screen without some kind of background, like a banner. I would want to draw the viewer’s eye into the story that is being revealed and see it from the perspective of the photog. The wide angle gives it an almost 3-D feeling. Getting a live truck or vehicle off to the side in the background would give it even more intensity. To do news photography now, you must think big picture, fast, immediate. The various renditions above feel cramped, tiny and overly staged/composed. As with art, first instincts are often best. First cover, busy as it is, is more magnetic than all the other attempts. Don’t understimate people working from the gut. Or he can just make it an e-book and be done with it, especially if it is young people he’s targeting with this book. I like your second version (in the images shown) best. I like the urgent feel of the LARGE type against the blue background. I like the page flow, more photos (visually relate to the visuality of the industry) and less background showing. I also appreciate that there is no text running half on the photo, half on the background. He may know about TV news, but he doesn’t know much about book-page layout. I wouldn’t feel confident reading professional advice from a book the cover of which does not look professionally designed. I like his first design. I like it because it is different. Lately I’ve reached the point where I get sick of seeing the same old stuff. Almost everything printed looks as if it came from the same designer — just go by any stand of brochures, any fast-food restaurant, or pick up a magazine. Monet was also criticized for being different when he would not paint like the “masters” in art school, while Warhol (boring as a can of soup) reminds me of “The Emperor’s New Clothes.” The point is: We are all different, and that’s what makes life great. Thought you would like to hear from a NON-designer (you know, the kind of people who are going to be purchasing this book). I loved the original design. When I saw it, I saw the tension and power of the news; I saw excitement, the wonderful chaos of the newsroom, and hard-hitting news. I also saw an exciting, satisfying career. Then I looked at the other designs — and I didn’t get that excitement. For me, the blues, golds, and reds, water down the overall thrill of the career that was inherent in the orginal cover. And the gray simply took the life out of it. Sometimes — and I will probably get a clonk on the head for this, but I do believe that sometimes, designers can get too much into design concepts. That being said, I love design and only wish that I, too, could do more than just play with it. I have heard John talk about the “feeling” of the design from the designer point of view, of course. I think market research is needed, though, so that a designer can also consider the “feel” that the purchaser has. Agreed, not always the BEST design, but the one he will buy! I agree with your final synopsis. Mike needs to sit down and do an over-the-shoulder work in progress. I believe his final version is mushy and lacks impact. His second-to-last version was better, but he broke the headline apart with his use of the color bar. The one thing that really bugged me you never commented on — the author’s name and attribution running over the photos, thus requiring a character outline to remain legible. The ultimate outcome is that whomever is paying the bill has ultimate say on how the project is finally produced, whether they are right or wrong. It’s our job as designers to (as you do so well) instruct them on the whys and wherefores of what we recommend, but the final decision (and ultimate success of the endeavor) is in the hands of the client. Wanted to let everyone know that I greatly appreciate all of the reactions to my book cover and the various iterations of it that happened completely unexpectedly. I was amazed to see the level of interest that John McWade took in my book cover design and very appreciative of the time he took with it. I was even more amazed, on reading the reactions on this page, to discover how many people liked my initial design. To be honest, I’d completely forgotten about it. I also welcome all of the people who preferred John’s covers and the design reasoning for them. I was greatly taken with the comments about the gray background and the various different planes that the photos were arranged on on my “final” cover design. Contrary to what some of your responses may think, I do listen and am receptive to comments. All of my independent films (which, in addition to TV news, I’m also involved in and were the subject of my first book, Naked Filmmaking) were shaped in the final stages by audience previews at several different screenings, each producing reactions that I incorporated about nine out of ten of in making the final edits to make the films more accessible. (Please note: I don’t know of any other indie filmmaker who tests his films before showing them.) Likewise with my film posters. In fact, in Naked Filmmaking I show several of the different posters and how they evolved and why — all based on audience reaction and input. 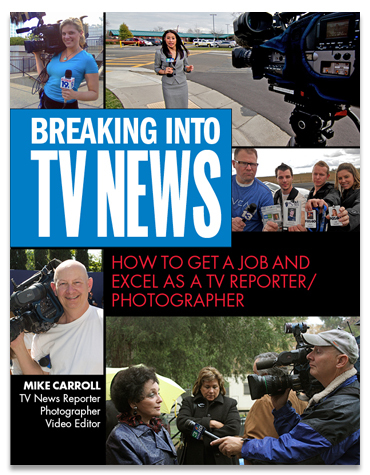 This book, Breaking Into TV News: How To Get A Job As A TV News Reporter-Photographer, was just the same. The final title was not even my own but one that evolved out of a day-long conversation with a reporter only a week before I put the book out on Amazon. I am not an island. All of my work is geared toward accessibility and ease of use, both in reading or watching. The only reason that I have done everything on my projects is that I do not have the money to hire someone. People who are designers, of course, say that you’re better off hiring a designer. But that means hiring someone and paying them. I don’t have that kind of money. I know someone who self-published his first book recently and did everything that he was told by professionals that he should do — hire an editor, hire a designer, hire a publicist. He sunk well over $10,000 into this first book. Had 2,500 copies printed up. All the pros said, “You’ll make your money back on the first printing and go into profit on the second printing.” That’s a lot of books he has to sell in the meantime. Also, he only gets 30% of the income that I make from my books because he has so many other people involved. He asked me when I would start earning money on my book. “On the first copy,” I told him. To people who are quick to say, “Hire a professional,” I respond, “You hire them and you pay for them.” It’s a different thing when it’s your own money. I also do not do Kickstarter or seek investors for my projects. I’ve paid for everything out of my own pocket. To all of you who said you liked the first jacket the best, even though it went against all the rules, I’m reminded of Leon Uris and his first novel. He spent two years writing it, filling over 200,000 words. When a publisher finally picked it up, he was sent the first proof. The publisher’s editor had slashed sections, restructured the book, and eliminated a first-person voice that threaded through the novel. Uris was deeply upset. He felt that his work had been emasculated. The publisher gave Uris a choice: Go with their version, or he could return their advance and they’d give him back his book. Uris decided to go with his gut and stick to his original book. The publisher reluctantly bent and went ahead and published his book his way. Battle Cry went on to sell two million copies in the first year, becoming the biggest first-year bestseller since Gone With The Wind. I don’t expect to do that with this book. It’s geared towards students. But I’ve learned from all of this, thanks to the many responses here, to stick with my gut from now on. A final note: Based on the reactions to John’s article, I’ve just modified the cover and gone back to the first design, which I just uploaded to Amazon. Many, many thanks to you, John, and all the people here who took the time and the interest to write. I greatly appreciate your thoughts and comments. Congratulations on your book, and I hope it is a great success! In defense of everyone who said “hire a professional,” in most cases this is smart advice. A poorly designed cover that looks like it was done in Microsoft Word does not convey the professionalism required to take a book seriously. (I understand that you are self-publishing and don’t have the $ to sink into hiring a professional. I work with one of the top 10 publishers in New York, and I also work with self-publishers. I price accordingly, and hopefully other self-publishers are able to find designers to work with them on price as well.) But I think you are the exception to the hire-a-professional rule. You are a creative person in a visual field, and this is an advantage over someone who is a doctor or lawyer. You are going to have a better eye and be able to produce a more professional cover. The cover you designed does not look like it was done in Word with clip art or worse, Word art! The Mike Carroll crit — we have all been there, but what an interesting exercise. Please ask your friend if he would be as patient and helpful as you were if you took control of his camera! All your design layouts looked far better (of course they would — you do this for a living). The final layout does not work for me — the right-hand bottom pic and bottom pic do not sit right! For me, the black, not the grey, for more impact. Hi Pam! Read Mr. Carroll’s comments directly above yours. The perspective from Pat, who makes the efforts of the TV reporter/photographer come alive on the TV screen, is very interesting! John’s second design had its emphasis on wide photos and a wide title box, too, as if he had consulted with Pat before the design (red type notwithstanding). Short, wide books are not comfortable to handle, though! John’s design work in his second rendition has the energy the author wanted, coupled with a professional design. It’s the best choice for the author. This Before & After post was exceptional! Thanks to John and Mike for sharing it. The fourth or fifth cover pictured is the best option based on the typography alone, and in my opinion would get the most sales. (The photos and positioning of them is debatable.) 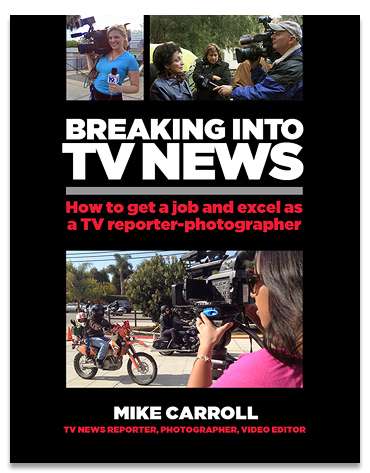 Thinking about the audience for this book and where/how they will get it: 1) TV NEWS stands out and is easily recognized as any generic TV logo that’ll draw those interested in the topic. 2) If I’m browsing the shelves of a box store and see it on a table, or searching Amazon.com, that title needs to stand out. It needs to be in your face, especially in thumbnail land online where tiny text gets ignored. The sub title is secondary and supportive. This quote is from the author in response to the quick redesign, and we need to stamp out this idea (along with double spaces, but that’s another discussion). Regarding sentences, not titles: Caps are harder to read. Using upper- and lowercase makes the sentence easier to scan. I think it is also a hint that the content will be easy to read — UPPERCASE YELLS, Title Case Takes Itself Too Seriously, and Sentence case is just right. In this instance, the subtitle sentence is long, so why not make it easy to read? Effective hierarchy and contrast convey power and authority more effectively. 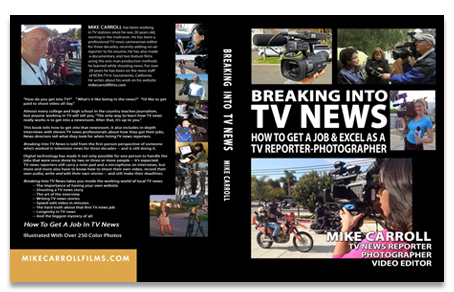 Thanks everyone for your thoughtful comments on the book jacket design for Breaking Into TV News. I learned a lot of design concepts from you that I’m sure I’ll use. I have a slightly different perspective on this subject. I’m an author, trainer, and former PR pro. Thanks to a 16-year subscription to B&A, I’ve been able to either design materials or explain my ideas to a professional designer with success. For me, the best design comes from a strong designer-client relationship with clear objectives and excellent communication. Recently I worked with Yale University Press to publish my second book, Listen. Write. Present. The Elements for Communicating Science and Technology . During this process, my co-author and I worked with many designers, editors, and marketing pros on the book. In order to sell it to Yale, we had to have a clear picture of exactly who our readers would be, how we would help sell books to them, and what the final product should look like. Thus, we submitted an 89-page proposal to Yale to sell a book that ended up with only 196 pages! Since we had such a clear vision of our book, we also had specific ideas on the title, interior design, and cover look. As you can imagine, so did our editorial team. Our executive editor scratched our amateur title and replaced it with a much more appropriate one. The art director took our suggestions on interior design and toned them down to a more professional style. She also graciously listened to our ideas for color choices and designed a brilliant cover. In the end, we are so glad they took care of these professional design details because the final product is even better than we envisioned! The most interesting thing about this topic is how I, myself, was swayed by logic and rationale as it was laid out. I changed my position a couple of times. As a marketing director for a reasonably large company ($100M), I am a client to several different designers. I am also a fairly competent designer myself, with a marketing and design business on the side. This article, and all the comments, illuminated so many things that I have experienced but never thought long enough to think through and articulate. Great info to draw from. Thanks. John, the comment that puts you in the National Treasure category is accurate. I mean that. Without coloring my opinion by reading all the comments, I find working with a client who “pretends” to be a designer and/or think he knows it all, to be an exercise in futility. I prefer working with those who hire me for my expertise, experience, skills, vision, and creativity. The client/designer partnership is one wherein together we can achieve bigger and better things. A good client listens to me, and I in return listen to him. The collaboration doesn’t work (for me) when a client submits his own design revisions. The author’s covers are, at best, amateurish. And the reason he was confused about the designs is because he is too close to the subject, unwilling to accept the professional advice and designs of others, and doesn’t know what he is doing when it comes to graphic design. He really didn’t want, or need, help to begin with. So, in my opinion, he was wrong in asking for a pro’s help with the cover. I am a good designer — certainly not anywhere near as great a designer as John. But I do good work. I get annoyed when a think-they-know-it-all-client spins my wheels and wastes my time. If a client thinks he has all the answers, and I don’t agree to the point where I can collaborate effectively, I just move on. In response to the last comment, I WAS NEVER “asking for a pro’s help with the cover.” I emailed to cover to a friend, who then forwarded it on to John McWade, who — entirely on his own initiative — did his own mockup. I then did my alteration, and he did more. I NEVER SOLICITED John’s expertise or any designer’s. I’m grateful for his contributions and for giving me ideas.